Whatever you write, and whether or not you have a blog or even a website, it’s a great idea to have an email list. You might have heard this called an “email newsletter” or “mailing list” – it’s basically the same thing. The idea is that you let interested readers enter their email address on your site, so you can send them updates. Some writers and bloggers do this on a regular basis, with a weekly or monthly “newsletter”. Others just email when they’ve got a particular bit of news to share – like a new book coming out. It’s up to you how you use your email list … but it’s crucially important that you have one. You might wonder why email’s so important. Wouldn’t it make just as much sense to encourage people to “like” your Facebook page, or follow you on Twitter, or engage with you in some more dynamic way? You’re limited to a certain format and length for your message – yes, you could write a very long post on Facebook, but people are unlikely to read it all! You won’t reach more than a fraction of your followers. On Twitter, things move fast; on Facebook, algorithms mean that most people won’t see your updates. Your audience may come and go – perhaps they joined Twitter intending to use it, but now they rarely bother to login. You can also write as much as you like, and make it look however you like. While people occasionally change email addresses, many will stick with the same email address for years – they won’t drop out like they would with social media sites. In your email inbox, once you open up a message, that’s the only one you’re seeing. Plus, you probably get lots of email offers from various companies (Photobox seem to email me nearly every day!) – so it seems quite natural to click an email link then buy something. I’m on a couple of people’s “email lists” that they run through their regular email account. They email me, and a bunch of other people, using the “BCC” feature. This is fine if you’re co-ordinating a small volunteering group or staying in touch with the supporters of a tiny charity, or updating family and friends on your travels. If you’re running a business, though, it definitely isn’t a good way to go about things! You’ll have to add new people to your list manually. This means it’s easy for people to drop off the list if you accidentally use an old version – and it’s horrendously inefficient. You may be tempted to add people to your list who haven’t told you they want to be on it. This is not only potentially annoying for them: if you’re in the US, it could land you in legal hot water as you won’t be complying with the “CAN-SPAM” requirements. You won’t have any idea how effective your email list is. You won’t know how many emails were opened, how many people clicked on a link in your emails, and so on. An email service solves all these problems. And, at least when you’re first building your list, it doesn’t need to cost you anything either. While it can take a little while to get to grips with how each particular service works, once you’ve sent out a couple of emails, you’ll find it’s a far more efficient process than trying to run things through your email account. 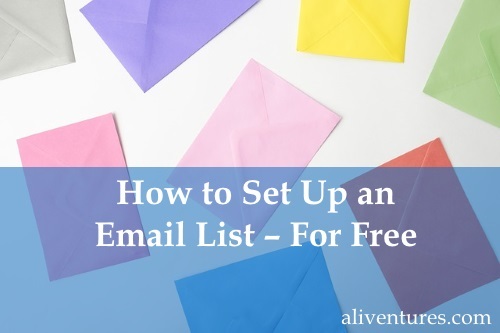 There are loads of options for setting up an email list, and you may want to ask around the writers or bloggers that you know to see what they’re using. There are plenty of other options out there, but if you’re just starting out with a mailing list, I’d suggest you choose one of these two. Both are free up to 1,000 subscribers (people on your email list) and both offer all the features you’re likely to need in the early stages. That means you’ve got plenty of time to build and establish your mailing list without having to spend any money on it. Once you’ve got your account set up, and before you put your “sign up” form on your website, you’ll need to create a Welcome email: this will be the first “proper” email that people receive from you (after the email asking them to confirm they want to be on your list). 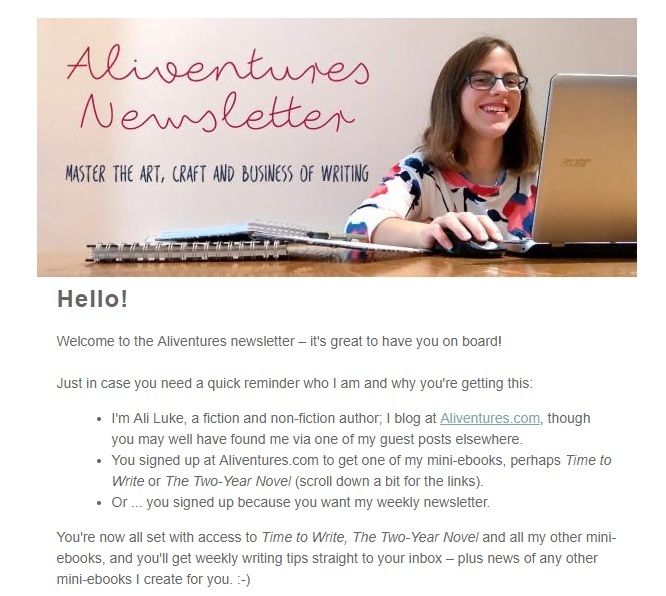 Some writers and bloggers will have a sequence of welcome emails across the course of a few days or even weeks, to engage with new readers. You may well have joined some email lists that work in this way – and it can be a great way to get up to speed with a particular blogger or writer’s work. Be friendly and personable – you may want to share a few brief details about your life. Encourage readers to get in touch. Most won’t – but those who do can be a great source of ideas and feedback. Both the Mailerlite and mailchimp are good services to get started. However I am a big fan of mailerlite and using it for my blogs. Mailerlite interface are far better than Mailchimp. I find it very easy to manage m subscribers and campaigns. Customer support is also very good. Thanks for writing this beautiful post. Thanks for adding your experiences, Vishwajeet! I use Aweber myself, and have used MailChimp when working with clients — but I’ve heard lots of excellent things about MailerLite, so I wanted to include it in the post. It’s great to hear how well you’ve got on with it.